The Democrats made a telling choice earlier this week when they chose Milwaukee as the site of their 2020 convention. In doing so, they appealed to the base of the party: a largely white Midwestern electorate that stood by them in every presidential election from the 1990s until 2012-though not 2016. They chose the familiar past, over the present and the future. Just as telling as the Milwaukee decision are the choices they did not make—Miami, anchored in a state that Democrats took in their only winning presidential elections this century; or Houston, a city that epitomizes what could be their future base in the rapidly growing and diversifying South. The demographic differences in the three convention contenders is striking. The Milwaukee metro is smaller, more slow-growing and less racially diverse than its two rivals. While Milwaukee is more diverse than the state of Wisconsin (two-thirds white and 81 percent white, respectively), whites are in the decided minority in the metropolitan populations of Miami and Houston. Aside from housing substantial black populations, the Hispanic populations of Miami and Houston are their largest minority groups. This is important, as Hispanics are the most populous minority group nationally, and especially so in several swing states. 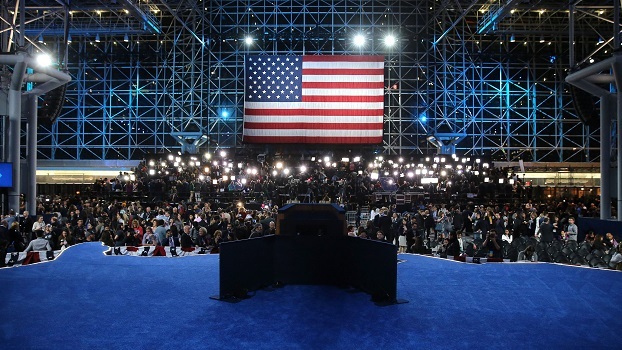 To hold a convention in those cities would send the message that the Democratic party is reaching out to growing more diverse, globally connected constituencies. Yet, the Democrats’ selection represents more than a focus on Milwaukee, or even the entire state of Wisconsin with its 10 Electoral College votes. They are clearly eyeing the possibility of taking back similar industrial “blue wall” states that cost them the presidency in 2016, such as Michigan and Pennsylvania, which, together with Wisconsin, they lost by a mere 80,000 votes. This effort will require taking a bite out of Trump’s hold on his key demographic constituency: whites without college degrees. Table 2 shows that Wisconsin’s electorate holds a good chunk of this group—comprising 63 percent of the state’s eligible voters, compared with just 41 percent in Florida and 33 percent in Texas. A convention that highlights such voters, who are prevalent in other Midwest states, might help to take back more than those 80,000 votes. And even if they lost all of the other states Trump, the math shows that the Democrats could still win the presidency with these states on their side. Results from the 2018 midterm elections suggest this could work. In that election, the states of Wisconsin, Michigan, Pennsylvania, and Iowa won six contested governorship and Senate seats, and took from Republicans a total of eight seats in the House of Representatives. Moreover, an analysis I conducted shows that if 2018 House of Representatives votes were tallied at the state level, Democrats would win all of the states they took in the 2016 election, plus Wisconsin, Michigan, Pennsylvania, Iowa, and Arizona—a feat that would yield them more than enough votes for the presidency. This analysis also indicates that a majority of the counties in the U.S.—including suburban, small metro and rural counties—showed higher Democratic (lower Republican) margins in the 2018 House elections than in the 2016 presidential election, and that some of the biggest Democratic shifts occurred in counties with large shares of working class whites. These findings are consistent with national exit polls that revealed decidedly weaker Republican support for House candidates in most categories of whites, including working white men with or without college degrees. Still, there is the question of whether the short-term gain of solidifying a longstanding regional demographic will stall longer-term advances in growing parts of the country where projections show Democrats having a natural advantage among now newly energized minorities, youth, and well-educated voter groups. These shifts have both demographic and political roots, which began to emerge with Obama’s two elections. A bit of history is in order: While Democrats have had success in winning most of the “blue wall” coastal and Midwestern states during the 1990s up through 2012, they have only won presidential elections (Clinton and Obama twice) when they supplemented blue wall gains with multiple state wins in the South and the Mountain West. This did not occur in the Bush elections of 2000 and 2004. Obama’s win in 2008 expanded the Democratic influence into southern states, such as Virginia, North Carolina, and Florida, and interior West states including Nevada, New Mexico, and Colorado. As I demonstrate in my book “Diversity Explosion,” this occurrence coincides with both the dispersal of Hispanics and Asians from immigrant gateway regions to these fast growing states, as well as continued black migration to the South. In both 2008 and 2012, racial minorities were responsible for Obama’s wins in most of these crucial states. One might argue that this heightened Democratic support among minorities could be attributed, in part, to these groups’ allegiance to the first African American major party nominee. However, it also demonstrates the demographic wind pushing at the backs of Sun Belt states won by Obama and potentially others, such as Arizona, Georgia, and Texas. This wind was evident in the high degree of youthful diversity among Democrats in the most recent House of Representatives freshman class. All in all, by selecting Milwaukee as their convention city, Democrats are sending a message that they are putting the recent and future strength of their party on hold. As the primaries unfold, let’s see how this strategy plays out—especially if, as many predict, one of the more progressive female or minority candidates prevails as the party’s presidential nominee.